Welcome to CFC Providing Affordable Systems Since 1991 to Schools and Families. Our mission to meet a tremendous need for technology in schools, with low-income families and nonprofits. 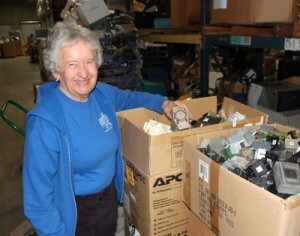 We accept donations of surplus computer system and accessories, use volunteers to refurbish them and place the equipment where it is needed. California is in the bottom three states in the United States when comparing the ratio of computers to students. The largest ethnicity in California is Hispanic. The “Achievement Gap” in our schools between Asian/Caucasion and Black/Hispanics is the same as the gap between those having home computers and connection to the Internet according to Dr. Rob Fairlie, a Professor of Economics at California State University, Santa Cruz. Dr. Fairlie has found that students in their senior year in high school with a home computer/laptop are twice as likely to attend college. We believe that all need access to technology to get a good education, and can have a level playing field. It isn’t fair that some have easy access to the Internet and others have none. Libraries often have long lines awaiting computer access, have limited hours and are often too far from families not having transportation to get there. When we receive donations. First, we remove hard drives before the computers are turned on. The drives are wiped using special Department of Defense level software. If the drive is too small or does not wipe complete, we destroy the hard drive using our DeGausser. A large burst of magnetic energy penetrates the drive and removes all data stored on it. Unfortunately, the drive can never be used again but there is still value as scrap aluminum. We load most of the computers with Windows 10 Microsoft licensed operating systems and office suites. All computer systems are guaranteed for a full year – hardware and software – except for laptops that we guarantee 90 days for hardware and a year for software. Nothing goes to the Landfill. We allow volunteers to earn a free computer after 50 hours of working at CFC. We also help other refurbishers to have a successful program. We are continuously looking for better ways to meet our challenge of providing technology to those that are unable to afford to buy something new.